Beaming messages, URLs, and other texts from a PC web browser such as Google Chrome, to your Android phone or tablet is nothing new. This function normally comes bundled with a host of other features in the form of a WiFi PC/Android client, or less commonly, as a standalone app such as Google Chrome to Phone. But if you aren’t looking for a fully fledged client, or find yourself unhappy with whichever standalone app is out there on the market, you might want to check out Message Beam. 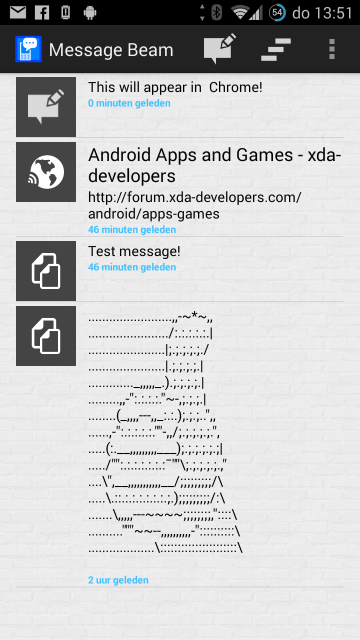 Developed by XDA Forum Member d-fader, Message Beam allows you to send instant texts to and from your Android device and Chrome browser on the PC (as opposed to ‘Google Chrome to Phone,’ which only goes from the browser to Android). This means not only links and other URLs, but interesting passages on a web page, messages, and even ACII art. As expected, Message Beam requires you to install the app on your device, and the chrome extension on the PC. Additionally, You can link multiple devices to the one browser, and encrypt the messages with a password you set up when you link the device. d-fader is also planning to add support for transfer of files such as images and documents, as well as more browsers and endpoints in the future. If you would like to check Message Beam out, visit the application thread for more information and download.